You can buy processed tamarind for cooking in a few forms: tamarind ball (tamarind flesh and seeds without shell), tamarind paste and tamarind sauce. Tamarind balls, which is just a ball or block of the shelled fruit, are available at Hispanic and Asian and South Asian markets. Cut off and soak as much of the ball as you want to cook in warm water and massage it with your hand to remove pulp from the rest. You may need to repeat the process a few times to get the tamarind out. The tamarind balls can be kept in your pantry for a few months. 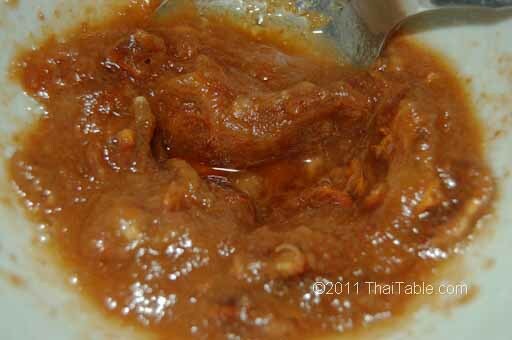 The tamarind sauce(pulp + water) however, can be kept a few days in the fridge. I prefer tamarind paste. While mine came from my grandmother's house, you can sometimes find it in markets. My grandmother would remove the tamarind pulp with water and let the mixture dry out in the sun. She would turn it everyday until it's dry. The paste is dark brown and really sticky. When I use this paste, I would reconstitute it in warm/hot water. The quickest way is to take a tablespoon of the paste and add half a cup of water and microwave it. In a minute or two you can have a sauce ready to be used in cooking. I keep my tamarind paste in the pantry, however, my mother recommends that tamarind paste should be kept in the fridge to keep the brownish paste from turning darker. Darker paste turns food dark, which is sometimes undesirable. Tamarind sauce, the easiest form to find in markets, has a few drawbacks. There is no standard ratio of fruit to water, so there is huge inconsistency in intensity of flavor from batch to batch or brand to brand. Then, frequently, there are solid crystals in the bottom of the container, which get into the food you’re cooking and add unexpected crunchies. Thai chili paste made with Thai spices and stir fried. Dark thick body with red oil. Great with tom yum goong or vegetables and rice. Chili paste made with roasted Thai spices. A well-balanced, slightly hot paste for the table that spices many dishes well.